My latest design/build, a bench with a mahogany top fitted around a stone leg. The supporting arch is one piece that passes through hand cut angled mortises in the cross braces. The arch and cross braces are walnut, and the leg is mahogany wedged in place using a through tenon and walnut wedges. I hollowed out the stone with an angle grinder to make the weight more manageable. Gorgeous! Great job and beautiful design. I think this is my favorite of 2018. I have been working stone into more of my projects and this gives me MUCH more encouragement that I am going in the right direction. But in addition to the stone I am really in love with the way the wood leg/arch contrasts and compliments the stone. Awesome piece, can’t say I have seen a rock leg, and I like it. Great video journey, but I really liked that moment @ 1:55 when you were in that beautiful outdoor setting, and it came to you. Hardly anything can beat the beauty of Nature, and to co-exist with it in your work is very nice. I love an air, die grinder, so many shapes that will shape metals, they certainly also work on the hardest of woods like going through butta. Your method of using the rocks roughness to leave an outline was smart work. I’m thinking that mask was just about done after your day of hollowing that rocks bottom, hardly anything is as clingy, and able to pack and block a mask, or filter like rock dust, MDF is tough, but doesn’t top rock. Loved you getting the welder into it, and liked that work around when you’d drilled the holes off angle. That old adage about mistakes/design opportunities came to mind. Your arch support was pretty good watching as well. Then the fitting, and finishing. The foam was interesting, looked liked it filled rather well based on that huge dome you were sawing off. I liked you showing goofs, then your splendid recoveries from them. Excellent journey, glad you invited us to go along with you. Thanks for posting, and good luck going forward. Gorgeous combination of wood and stone, amazing work. Looking forward to watching the video. This design just incredible. Wow! 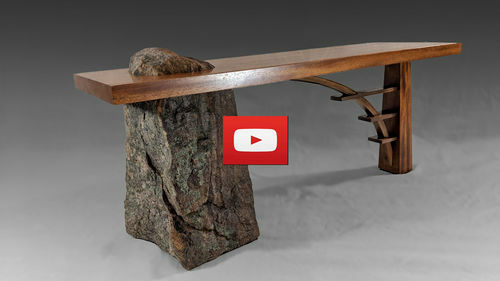 I glad I watch the video, so many details in the build of such a beautiful bench. Thanks! Wow…so creative. Love the design. Thanks for sharing. Beautiful bench and great video. Before watching the video I was certain your inspirations were Nakashima and Frank Lloyd Wright – didn’t expect a bridge and a stone fireplace. Can’t believe it didn’t take longer to hollow out that stone. Thanks for sharing and Merry Christmas. I’m thinking your bench is beautiful and so is the fire place and so is Multnomah Falls in Oregon. So, so beautiful! I love everything about it. Great photography as well. You are an artist. Really cool bench. This is absolutely amazing! I really love the natural modern look to begin with, but the detail and craftsmanship are really make it stand out more. I can’t wait to get home from work so I can check out the video! The piece is amazing and the video was very informative. I had to go back and check out all the rest of your videos. Looking forward to future projects!! !